It's snowy February here in Massachusetts. It's a fine month to stay indoors and work on that pile of UFOs. My stack of quilt tops which need to be turned into finished quilts is beginning to rival the height of the snowbanks outdoors! 4 of the quilts are bed size (2 twin, 2 queen +), 3 are lap or crib size. One of bed quilts needs to be quilted on a long arm--I don't expect to get that one done this month. The others I can do on with my Bernina. These aren't the sort of projects I can just whip out. I'll post some of my quilting on the blog as I work. I also plan to share some other sewing/fiber projects during the month. Here's the first--placemats. It's the perfect project to work on applying bindings with mitered corners. 4 placemats = 16 miters! You'll be a pro when you're done! These placemats, which look like Spring are made using a fabric with the design printed in squares. I just quilted along the line between the different designs, making this an easy project. Here is slide show of applying a binding to a quilt. This binding was made with scrap strips so the binding may change colors between frames. For the quilt, I used a 2 1/2 inch double fold binding with diagonal seams between the binding strips. With the placemats, I used straight 1/4 inch seams between binding strips. They are a bit easier to manage on a small project. On the last side of the placemat, overlap the end of the binding strip 1/2 inch over the beginning piece of binding. 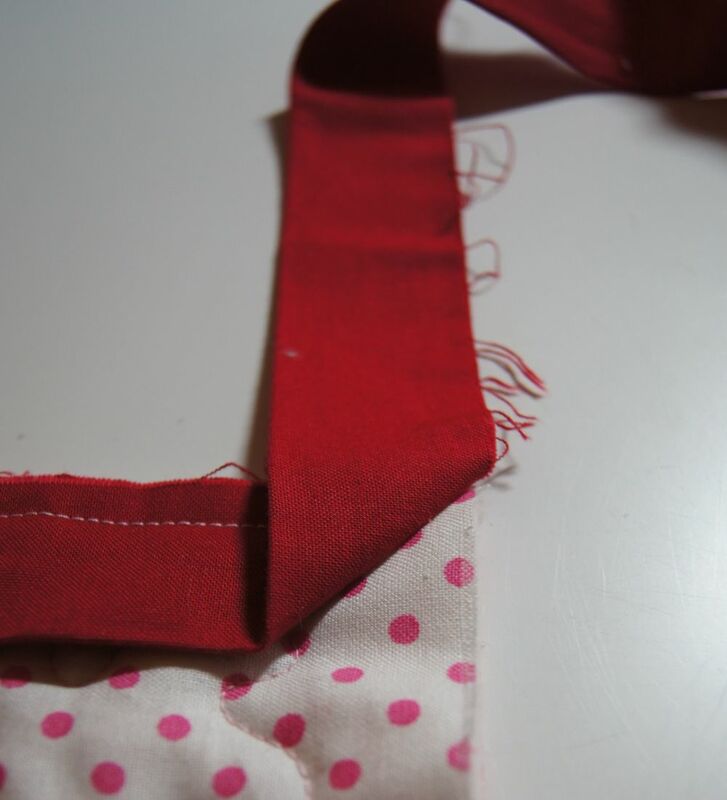 (With diagonal seams measure 2 1/2 inches OR the width of the fabric cut for the binding). Cut the end piece at that 1/2 inch point. Open up the folds in the binding, put right sides together and sew a 1/4 inch seam. (With the diagonal seams, follow photos below). Finger press the seam open, turn the binding to the right side and finish sewing the binding to the placemat. Have fun working on your miters! Enjoy your new placemats! Happy Ground Hog's Day!! Any Ground Hog in Massachusetts foolish enough to dig out of the burrow is definitely NOT seeing her shadow today--we are in the middle of a Nor'easter! Better luck next time!